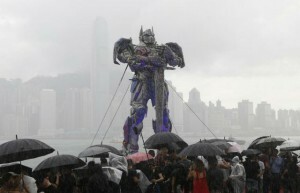 Once again Michael Bay and the cast of Transformers 4 return to Hong Kong, this time with a lot more security. Hong Kong will host the world premier of Transformers 4 : Age of Extinction to say thanks for the city letting them film part of the movie there. In the film two of Hong Kongs iconic landmarks the Hong Kong Convention and Exhibition Centre will be demolished, thankfully for CGI they didn’t have to damage the real buildings. 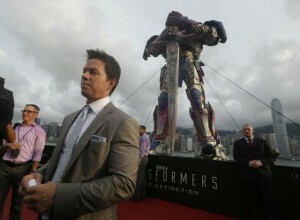 At the premier Michael Bay was joined by the films lead Mark Wahlberg aas well as as Nicola Peltz, Kelsey Grammer, Jack Reynor, Stanley Tucci and Chinese actors including Li Bingbing and Han Geng. The awesome visual landscape of Hong Kong and giant robots in the movie will make it well worth watching in the IMAX in 3D when it released world wide at the end of the month.